Finding a restaurant in a tiny little town with a kitchen garden right next door is unusual in these parts. So, when we drove thought a tiny little town recently, and I saw a kitchen garden next to a trendy restaurant on Main Street, I requested we stop so I could take some pictures. Simple and elegant, it featured pots of herbs and a trellis or two for beans to grow on. Rows and clusters of cabbages and garden greens, carrots and radishes, and vines of squash and cucumbers were set in a grassy space. A nearby table, convenient for harvest and cleaning, sat nearby. Right next door was a covered patio with seating for dining alfresco. Colorful table clothes, comfortable chairs, and a bubbling waterfall added to the ambiance --- as did the kitchen garden across the fence. A side door leads to more formal dining options. But, who would want to eat inside when such beauty and serenity greet the guest in this pretty place? An old adage says that "The kitchen garden is the best of all gardens". 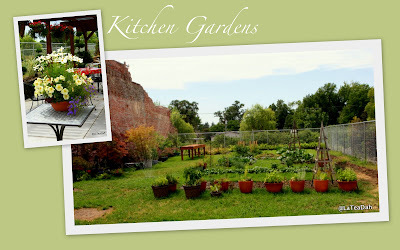 The kitchen garden is a home garden where vegetables, herbs, berries, and fruits are grown and used for food. Generally, it is small enough to be cultivated with hand tools and a little elbow grease! Ideally, it is easy accessible from the kitchen or back door of the house for convenience and ease. A well-planned kitchen garden may provide fresh herbs for seasoning dishes for every month of the year. Sage, winter savory, hearty rosemary and parsley can be harvested even in the winter in some locales. Although kitchen gardens for restaurants or gourmet cooks are fashionable, a kitchen garden can be handy for the three-meal-a-day household cook. Using home-grown produce and herbs can add fun, flavor, and nutrition to family meals. Have you planted your kitchen garden? It's not too late! What a pleasant little garden....I'd like to enjoy a meal or two at that restaurant! Yes, I have a tiny wee kitchen garden. I have basil, rosemary, chives, and spearmint. Not too exciting, but that's the story. I always admire anyone's real kitchen garden. I think that they are charming. A kitchen garden is the best. We have a small one this year. The first ripe tomato is almost ready to be picked, I can't wait. A kitchen garden with a restaurant would be perfect. My kitchen garden is as small as a pot of herbs. The restaurant has a lovely garden. I enjoyed seeing it. If I lived near that restaurant I would go there frequently!